We're organizing a new technoshamanist encounter, this time in CASA NUVEM in Beco do Rato, Rio de Janeiro. The event will take place on Tuesday June 30th and Wednesday July 1st, 2015, 14:00 to 24:00 hours. We will take advantage of the visit of our associate Carsten Agger who organized the technoshamanism encounter in Aarhus, Denmark in 2014, to create a new event here in Rio de Janeiro. The topic of this new encounter is FICTION AND NOISEOCRACY. In addition to being interested in democracy of objects, animism as political theology, the anthropocene as the aging of the Earth, the spectrology of the garbage can, it's important for os to concentrate on listening. How can we listen to all signals that are emitted? 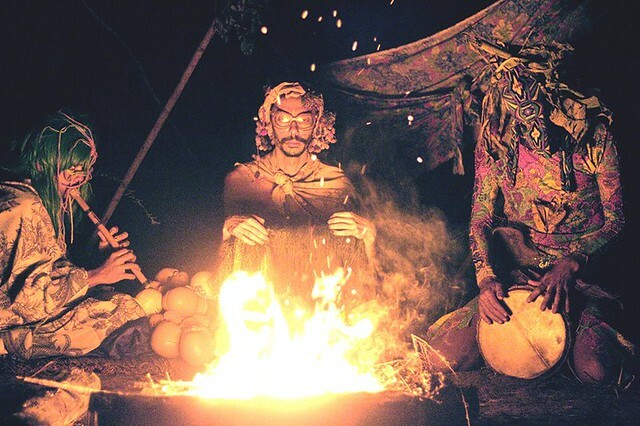 Technoshamanism is a wave that constructs rituals, mixing DIY technology with deeper insights. We have many questions: Which new languages will we learn from the electronic and shamanic technologies? Which didactics will we be able to access with the use of entheogens? What can we learn from insanity? Which kinds of fiction are we constructing in this age of paranoia, where we are always living with comprehensive State control and the threar of exhaustion of the Earth's ressources, in order to sustain our civilization's way of life? How can the ritual help os conceptualize and invent the future? FICTION AND LISTENING are thus the baselines of our encounter, which will otherwise attempt to create a convergence of the DIY movement, free software, cryptography, free radio, hacklab and bio-hacklab, including permaculture, forest gardening, urban gardens, all of it thoroughly bathed in magic, in rituals and in ancestrofuturistic knowlgedge. This is a theoretical and practical encounter, which will be transmitted in its entirety by a free radio. How can we stitch together a social body which is critical, practical and magic at the same time? And which bew modalities can we invent to explain these issues? These questions are crucial in order to consider the future, remembering that the future is sometimes behind us, sometimes in the middle of things, and sometimes ahead â€¦ following associative spirals which clamp together to create new possibilities while recreating the past and delineating new territories for living in the present. Rituals of desuffocation and re-creating awareness seem more important today than tedious training programs. Ritual, immersive events and collective intensification of conscience and horizontal dialogues all point towards the liberation of the captive outlines of the CURRENT REALITY. If we're indeed living in the era of comprehensive control, to a large extent constructed on top of the fiction of carbon-based fuels, we're in greater need than ever of making the machine behind the collective unconscious run again, of freeing all those ghosts from the garbage cans and the prisons; we need to repopulate our imagination and make all our fears and impediments of thought take a break! We can and will continue to invent new forms of life without becoming victims, being paralyzed or dying. Introduction: "Seminal thoughts for a possible technoshamanism"
Program for the event (in Portuguese).